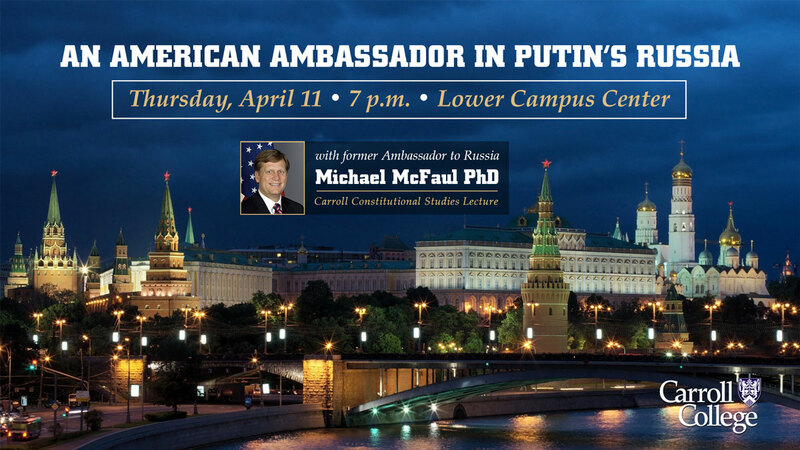 HELENA – The Carroll College Department of Political Science and International Relations is very pleased to announce that former Ambassador to Russia, Michael McFaul, Ph.D. will visit Carroll College on Thursday, April 11, 2019. He will present an evening community lecture, entitled “From Cold War to Hot Peace: An American Ambassador in Putin's Russia.” This event is free and open to the public. Michael McFaul is a leading expert on Russia, American foreign policy, and democratic development around the world. A former U.S. ambassador to Russia (2012-14), McFaul is currently a professor of political science at Stanford University, the director of Freeman Spogli Institute for International Studies and the Peter and Helen Bing Senior Fellow at the Hoover Institution. In addition, he is an analyst for NBC News, a contributing columnist to the Washington Post, a New York Times bestselling author and prolific on Twitter with over 372,000 followers, @McFaul. Professor McFaul was born and raised in Butte and Bozeman, Montana. During high school in Bozeman, McFaul participated in policy debate; his partner was current U.S. Senator Steve Daines. This event is hosted by the Carroll College Department of Political Science and International Relations, with support from the Apgar Foundation. Carroll College also acknowledges the collegial partnership with the University of Montana and the Maureen and Mike Mansfield Center, with whom Carroll faculty have worked to bring the Ambassador to Montana. This event is free and open to the public and members of the Helena community are encouraged to attend.